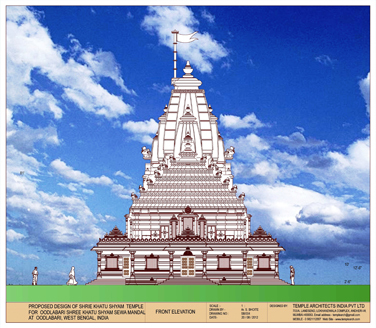 Shree Khatu Shyam Temple is proposed by Shree Khatu Shyam Sew Mandal, Oodlabari, West Bengal, India. 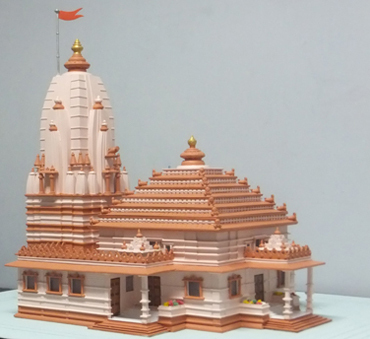 This Grand temple is designed by Temple Architect Subhash Govind Bhoite from Mumbai. 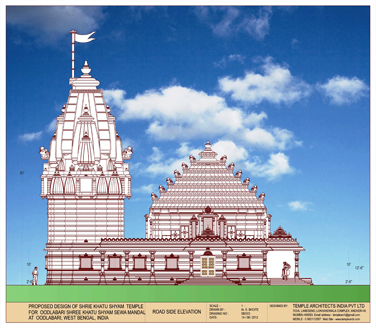 Temple Plot of 36, 250 Sft. Is touching to National high way from Sevak to Guwahati in West Bengal. 81 feet high Temple building is facing East direction and is with 2 Nos. of floors; 4,000 Sft. Basement with 2 nos. of entries for Satsang & Prasad hall (Dinning area) and 4, 000 Sft. Ground floor as Sabha Mandap with Garbha Griha. Shree Khatu Shyam is Main Deity of Temple will be in Garbha Griha. Temple building is having other facilities rooms as Kitchen, Store Rooms and Office etc. also. Sabha Mandap has 3 nos. of entries. Building is constructed in RCC and Brick work. Finishing work will be done with carving on heavy Sand Stone Cladding. Local Trustees, Shri. Anand Agarwal, Shri. Vinod Agarwal, Shri. Pradeep Agarwal and Shri. Asok Das are taking keen interest in execution of the work at site as sewa. Shree Khatu Shyam devotees are increasing day by day; so, all Temple Trustees are looking forward to build a Grand Shree Khatu Shyam temple in West Bengal. Temple will be completed in 2 years time. Further, they have proposed to build a big Ashram Building (Guest House) in the plot behind the temple building.
. Barbarika had obtained a boon from Krishna to the effect that he would be known by Krishna's own name (Shyam) in the Kaliyuga era (presently ongoing) and worshiped. Krishna had declared that Barbarika's devotees would be blessed just by pronouncing his name from the bottom of their hearts. Their wishes would be granted and troubles removed if they worship Shyamji (Barbarika) with a true piety. The legend begins with the Mahābhārata. Barbarika alias 'KhatuShyam' alias Shyam Baba was a grandson of Bhima, Second of the Pandava brothers. He was the son of Ghatotkacha (who in turn was son of Bhima) and Kamkantkata Ma Morwi . Even in his childhood, Barbarika was a very brave warrior. He learnt the art of warfare from his mother. God Shiva, pleased with him, gave him the three infallible arrows (Teen Baan). Hence, Barbarika came to be known by the appellation Teen Baan Dhaari, the "Bearer of Three Arrows". Later, Agni (the god of Fire) gave him the bow that would make him victorious in the three worlds. Krishna then challenges him to tie all the leaves of the peepal tree under which he was standing with these arrows. Barbarika accepts the challenge and starts meditating to release his arrow by closing his eyes. Then, Krishna without the knowledge of Barbarika, plucks one of the leaf of the tree and puts it under his foot. When Barbarik releases his first arrow, it marks all the leaves of the tree and finally starts revolving around the leg of Krishna. For this Krishna asks Barbarika, as why was the arrow revolving around his foot? For this, Barbareek replies that there must be a leaf under his foot and the arrow was targeting his foot to mark the leaf that is hidden under him. Barbarika advises Krishna to lift his leg, since, otherwise the arrow will mark the leaf by pricking Krishna's leg. Thus, Krishna lifts his foot and to his surprise, finds that the first arrow also marks the leaf that was hidden under his foot. Of course, the third arrow does collect all the leaves (including the one under Krishna's foot) and ties them together. By this Krishna concludes that the arrows are so infallible, that even if Barbarika is not aware of his targets, the arrows are so powerful that they can still navigate and trace all his intended targets. The moral of this incident is that, in a real battle field, if Krishna wants to isolate some one (for example: the 5 Pandava brothers) and hides them elsewhere in order to avoid them from being Barbarika's victim, then Krishna will not be successful as the arrows after destroying the whole army, can trace the hidden targets also and destroy them. So, nobody will be able to escape from these arrows. Thus Krishna gets a deeper insight about Barbarika's phenomenal power. The other version of story tells that the first arrow indeed pricks Krishna's leg and mark the leaf that is hidden under Krishna's foot. This becomes a weak spot of Krishna. Prior to this event, lord Krishna also gets a boon from sage Durvasa that his entire body except his leg will be immune to all weapons. Hence, only his leg will be vulnerable. In the end of Kurukshetra war, when Krishna revives Abhimanyu's son Parikshit, he looses half of his strength and thereby making him even more weaker. Later, in Mausala parva, a hunter by name Jara hits at Krishna's foot mistaking him for a deer leads to the death of Krishna. In other words, this weak spot on Krishna's foot was first created by Barbareek's arrow. The guised Krishna then sought charity from Babarika. Barbarika promised him anything he wished. Krishna asked him to give his head in charity. Barbarika was shocked. Perceiving that all was not as it appeared, he requested the Brahmin to disclose his real identity. Krishna showed Barbarika a vision of His Divine Form and Barbarika was thus graced. Krishna then explained to him that before a battle, the head of the bravest Kshatriya needs to be sacrificed, in order to worship/sanctify the battlefield. Krishna said that he considered Barbarika to be the bravest among Kshatriyas, and was hence asking for his head in charity. In fulfilment of his promise, and in compliance with the Krishna's command, Barbarika gave his head to him in charity. This happened on the 12th day of the Shukla Paksha (bright half) of the month of phaagun on Tuesday. 2.Barbareek was a Yaksha in his previous birth. Once Lord Brahma and several other Devas came to Vaikunta and complained to Lord Vishnu that the Adharma on Earth was increasing; it was not possible for them to bear the tortures causes by the wicked people. Hence they came to seek the help of Lord Vishnu to check them. Lord Vishnu told the Devas that he will soon incarnate on Earth as a human being and destroy all the evil forces. Then, a Yaksha told the Devas that he alone is enough to kill all evil elements on the Earth, and it was not necessary for Lord Vishnu to descend to Earth. This hurts Lord Brahma very much. Lord Brahma curses this Yaksha that whenever the time comes to eliminate all the evil forces on Earth, then Lord Vishnu will first kill him. Later, the Yaksha takes birth as Barbareek and Lord Krishna seeks his head in charity as a result of this curse. At the end of the battle, the victorious Pandava brothers argued amongst themselves as to who was responsible for their victory. Krishna suggested that Barbarika's head, which had watched the whole battle should be allowed to judge. Barbarika's head suggested that it was Krishna alone who was responsible for the victory: his advice, his presence, his gameplan had been very crucial. Other names Barbarika: Khatushyam's childhood name was His mother and relatives used to call him by this name before the name Shyam was given by Krishna. Sheesh Ke Daani: Literally: "Donor of Head"; As per the legend related above. Haare Ka Sahara: Literally: "Support of the defeated"; Upon his mother's advise, Barbarika resolved to support whoever has less power and is losing. Hence he is known by this name. Teen Baan Dhaari: Literally: "Bearer of three arrows"; Reference is to the three infallible arrows that he received as boon from God Shiva. These arrows were sufficient to destroy the whole world. The title written below these three arrows is Maam Sevyam Parajitah. Lakha-datari: Literally: "The Munificent Giver"; One who never hesitates to give his devotees whatever they need and ask for. Leela ke Aswaar: Literally: "Rider of Leela"; Being the name of his blue-coloured horse. Many call it Neela Ghoda or "blue horse." Khatu Naresh: Literally: "The King of Khatu"; One who rules Khatu and the whole universe. Kalyug ke Avtaari: Literally: "The God of Kaliyug"; As per Krishna he will be the God who will save good people in the era of Kalyug. SHYAM PYAREY: Literally: "The God who love all and all love to him, the spiritual relation between bhakt and bhagwan called nishkaam pyaar/prem "
Baliya Dev: Literally: " Dev with super power ; newly born children are blessed in the temple located in Vasna, Ahmedbad, Gujarat. After the Mahābhārata battle, Barbarika's head was drown in the river name rupawati by lord krishna giving lots of blessings.After many years when kalyug started the head was found buried in the village of Khatu in present-day Rajasthan. The location was obscured until well after the Kaliyuga period began. Then, on one occasion, milk started flowing spontaneously out of a cow's udder when she neared the burial spot. Amazed at this incident, the local villagers dug the place up and the buried head was revealed. The head was handed over to a Brahmin who worshipped it for many days, awaiting divine revelations as to what was to be done next. 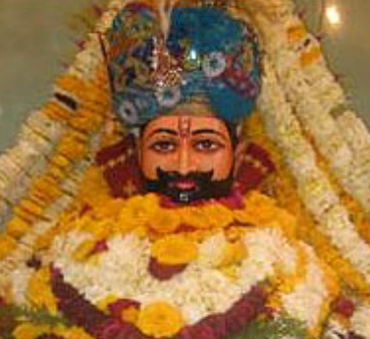 Roopsingh Chauhan, king of Khatu, then had a dream where he was inspired to build a temple and install the head therein. Subsequently, a temple was built and the idol was installed on the 11th day of the Shukla Paksha (bright half) of the month of Phagun. The original temple was built in 1027 AD by Roopsingh Chauhan and his wife Narmada Kanwar. In 1720 AD, a nobleman known as Diwan Abhaisingh renovated the old temple, at the behest of the then ruler of Marwar. The temple took its present shape at this time and the idol was enshrined in the sanctum sanctorum. The idol is made of rare stone. Khatushyam is the family deity of a large number of families. Barbarika is worshiped as Shyam, being Krishna himself. Therefore, the flavour of the festivities reflects the playful and vibrant nature of Krishna. The festivals of Krishna Janmaashtami, Jhool Jhulani Ekadashi, Holi and Vasant Panchami are celebrated with gusto in the temple. The Phalguna Mela detailed below is the principal annual festival. Mangala Aarti: performed in the early morning, when temple is open. Shringaar Aarti: performed at the time of make-up of Baba Shyam. The idol is grandly ornamented for this aarti. Bhog Aarti: performed at noon when bhog (Prasadam) is served to the Lord. Sayana Aarti: performed in the night, when temple is closed. Two special hymns, the "Shri Shyam Aarti" and the "Shri Shyam Vinati," are chanted on all these occasions. The Shyam mantra is another litany of the Lord's names that is chanted by devotees. Shukla Ekadashi and Dwadashi: The 11th and 12th days of the bright half of every month in the Hindu calendar is of special significance to the temple. This is because Barbarika was born on the 11th day of the bright half of the month of Kartika, and he donated his head (Sheesh) to Krishna on the 12th day of the bright half of the month of phaagun on Tuesday. Darshan on these two days is therefore considered auspicious and devotees come in their thousands every month. The temple remains open throughout the night that falls between these days. Night-long Bhajan sessions are organised since devotees traditionally pass the night in singing the praises of the Lord. Devotees organise Bhajan programmes and invite Bhajan singers to sing devotional songs. Bathing in the Shyam Kund: This is the holy pond near the temple from which the idol was retrieved. It is believed that a dip in this pond cures a person from ailments and brings good health. Filled with devotional fervor, people take ritual dips in the Shyam Kund. They believe that this will relieve them of diseases and contagion. Bathing during the annual Phalguna Mela festival is deemed specially salutary. Nishan Yatra: It is believed that your wishes are granted if you offer a Nishan at the temple. A Nishan is a triangular flag of a particular size, made of cloth, which is hoisted on a bamboo stick. It is carried in one's hands while covering the route from the town of Ringas to Khatu (17 km) on (bare) foot. Nishans are offered in millions during the Phalguna Mela. Phalguna Mela: The most important festival associated with the temple is the Phalguna Mela which occurs just 3-4 days before from the festival of Holi. Barbarika's head appeared on Phalguna Shuddha Ekadashi, the 11th day of the bright half of the Hindu month of Phalguna. Therefore, the fair is held from the 9th to the 12th of that month. An estimated one million devotees visit the temple during these four days from all corners of the country. There is virtually no vacant space in the town during this period. There is celebration and festivity in the moods of the devotees who wait for hours in long serpentine queues for a moment's glance of the deity. The whole town, along with the temple, is illuminated. Singers from all over the country come here to perform Bhajans on this holy occasion. Special arrangements are made for feeding the devotees in almost all the Dharamshalas and rest-houses. Special trains and buses operate during the mela. The government of Rajasthan takes care of the law and order during the fair.